Editor's Note: Michael Douglas subsquently issued a statement clarifying his opinion and saying his comments were taken out of context. 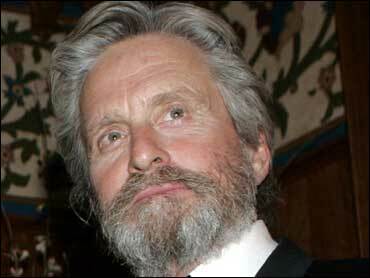 Watch out Brad, Michael Douglas is taking some shots regarding your divorce from Jen — at you and girlfriend Angelina Jolie. "I don't know about Brad Pitt, leaving that beautiful wife to go hold orphans for Angelina," Douglas snipes in GQ's April issue, hitting newsstands March 21. "I mean, how long is that going to last?" Pitt and ex-wife Jennifer Aniston divorced in October 2005. Since then, Pitt has adopted Jolie's children, Maddox and Zahara, and is expecting a child with the bombshell actress this summer. Calls by The Associated Press to Pitt's representative, Cindy Guagenti, and Jolie's manager, Geyer Kosinski, were not immediately returned Tuesday. The 61-year-old Douglas also took swipes at actresses Renee Zellweger and Julia Roberts: "I mean, don't ask me what happened with Renee Zellweger. I don't know how you get married for four months. And Julia with Lyle." Zellweger annulled her four-month marriage to country singer Kenny Chesney last fall, while Roberts divorced singer-songwriter Lyle Lovett in 1995 after a two-year marriage. As for his marriage to actress Catherine Zeta-Jones, Douglas says he's "been fortunate. You learn to respect something of value and nurture it and treat it well." Douglas and Zeta-Jones, 36, were married in 2000 and have a son, Dylan, 5, and a daughter, Carys, 2. Douglas also has a son, Cameron, 27, from a previous marriage. After a three-year hiatus, Douglas will return to the big screen this year in the psychological thriller "The Sentinel," starring opposite Kiefer Sutherland, Kim Basinger and Eva Longoria.